Well so much for the milder weather of my last post. Today barely into the teens and tonight -25F with wind chill. 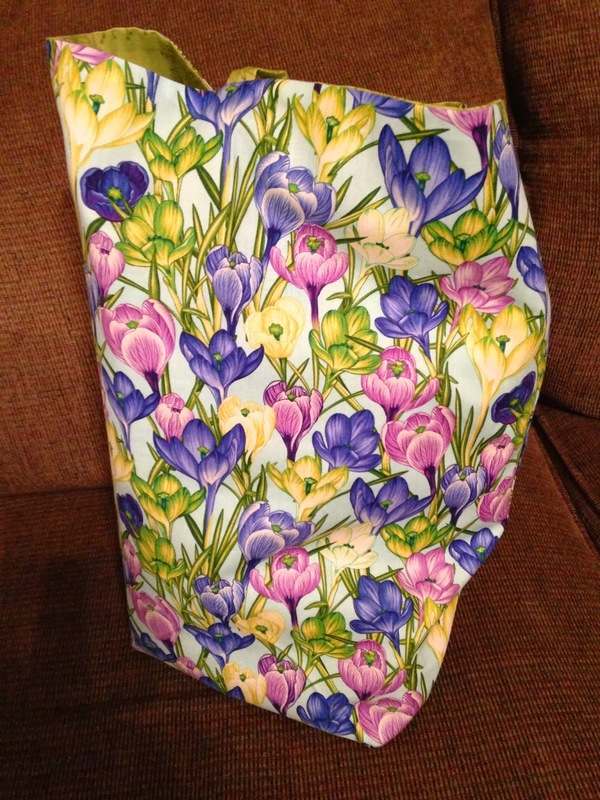 I have added pictures of the feed sack tote and my second project bag with crocuses blooming. 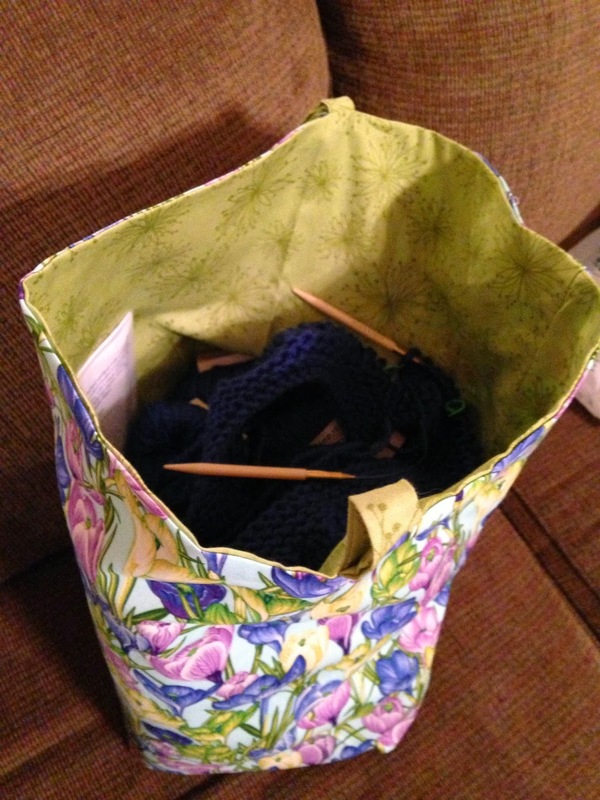 The project bags with hold all the yarn, needles, pattern etc for a sweater project. I added a knit meter to the blog today. I am interested to have an idea of how many yards of yarn I use in a year. 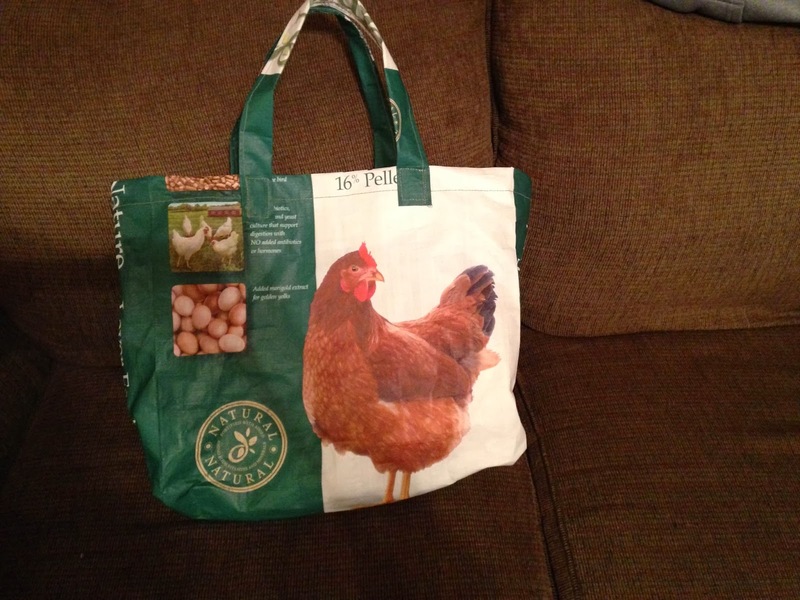 Life on the farm is quiet this time of year with feeding and watering the poultry and goats. We raise Nubian dairy goats and Angora goats. The fiber goats came along after I fell in love with spinning and curly locks. I am looking forward to this years baby goat crop in early March. The dairy goats will have spots and splashes and the angoras were bred to a new charcoal colored buck for a multicolored kid crop. I am the type that does like to set yearly goals. I try to meet them although my success varies. One goal I am hoping to reach is during the Olympic Games finishing the fleece I started spinning during Tour De Fleece last summer. This particular fleece is actually CVM and is a light gray. Also knit at least 2 sweaters, spin up enough fiber to make a full sweater. I also would like to attend a new- to- me fiber/yarn event. Last goal is start an audio podcast. I may be overly ambitous- time will tell. What are your goals for 2014?